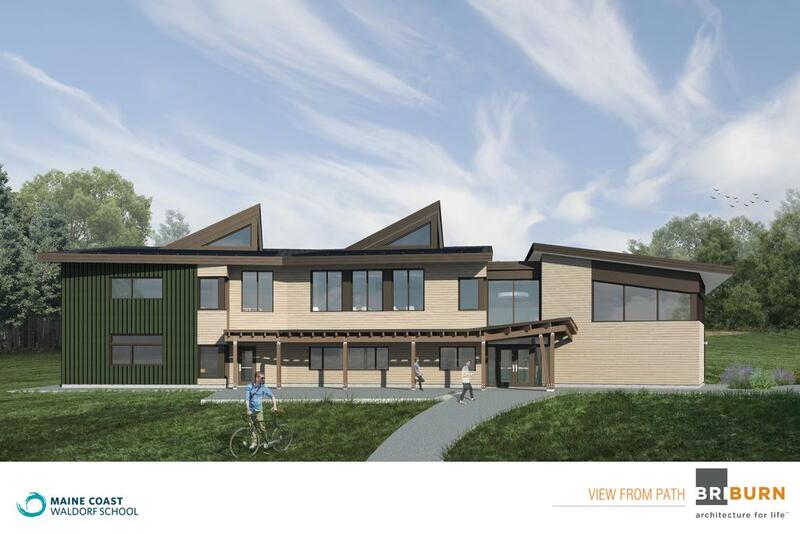 Maine Coast Waldorf School in Freeport has embarked on a $300,000 fundraising effort, which will cap off a $6.1 million capital campaign for major construction projects – including a new high school just started on the Desert Road campus. The new high school is one of three projects targeted in Maine Coast Waldorf School’s “One Campaign.” Maine Coast Waldorf now operates its high school on Pineland Drive in New Gloucester. Plans call for the new school in Freeport to open in the fall of 2017. Additions to the Community Hall on the Freeport campus represent Phase 1 of the construction projects. The high school is Phase 2, and a new Educational Support Center for the lower grades is Phase 3. Construction on the support center, behind the grades 1-4 building, also is slated to begin this fall. Warren Construction Group of Freeport is the general contractor. The school has raised $3.8 million to date, which includes a $1 million grant from the Windover Foundation. It will also borrow $2 million. Lynn Espy, the school’s development director, said that the school kicked off its fundraising, or “community phase,” of the effort on Sept. 16, with an evening event called “Breaking New Ground.” Fundraising itself started last week. Espy said that the One Campaign will transform the school “by unifying and expanding” its Freeport campus to support the 250 students from early childhood to 12th grade, and the 50-member faculty and staff. Espy said that the scope of the projects is remarkable for “a young, 32-year-old school.” The Waldorf School began in 1984 in West Bath, was moved to a home in Freeport and then to South Freeport prior to opening its Desert Road facility in 1996. Lynn Baird, school admissions director, said that this past year’s interest in the Waldorf high school was the highest seen, and predicted that once the high school is located in Freeport, the demand will only increase. The school, known until early this year as Merriconeag Waldorf School, started its high school with ninth and 10th grades in the fall of 2007. The school grew through Grade 12, and in 2010 graduated its first high school students. The new high school will be built for 80-plus students. Espy said that the name change to Maine Coast Waldorf School, meant to enlarge the school’s geographic sphere, has worked. High school teacher David Sloan, one of the founding high school teachers, said in a press release that he looks forward to older and younger students being able to establish daily contact, and mutually benefit. “Having the new high school building on the Freeport campus will fulfill our decade-long dream of uniting the entire school,” Sloan said. Briburn, a Portland-based archtecture firm, designed the new high school. It will be a “net zero” (zero net energy consumption) building and will be constructed using sustainable materials and methods. The high school will be located on a 6-acre parcel adjacent to the grade-school campus. It is the second high school construction project underway in town. Freeport High School is in the midst of a $14.5 million renovation and expansion. A new café and new kitchen will provide dining space for a high school lunch program, teaching space for the expanding gardening programs and an enlarged event area. Also, there will be two new “flex spaces,” which support the music and drama programs. Plans call for completion of the Community Hall expansion by January, with other additions staring next summer. Work on the Educational Support Center, designed by Kaplan Thompson Architects, also starts this fall and will be complete in January. The additon will provide dedicated space for small group and individual work with students. The One Campaign also includes improved parking, upgraded cross-country running trails, a new athletic field and upgrades to the property’s original barn for gardening and agriculture programs. Maine Coast Waldorf School offers a tiered tuition system, and also provides a tuition adjustment for families unable to meet the cost. Tuition for grades 1-5 is $15,950. The cost is $16,950 for grades 6-8, and $19,850 for grades 9-12. For students of early childhood age, tuition varies according to the amount of days and the amount of time spent in the classroom, from a low of $3,850 to a high of $16,600. According to the Association of Waldorf Schools of North America, Waldorf schools “offer a developmentally appropriate, experiential, and academically rigorous approach to education.” Waldorf education is based on the educational philosophy of Rudolf Steiner. An architect’s drawing of the new high school being built at the Maine Coast Waldorf School in Freeport.